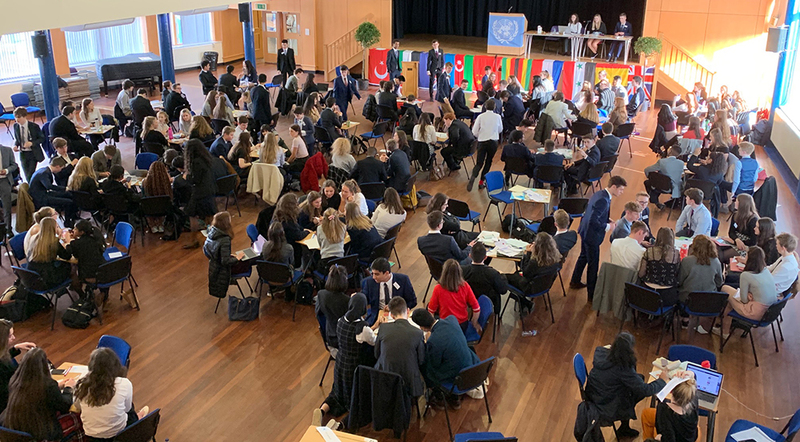 Some 200 staff and pupils from 12 schools across Scotland attended HutchieMUN 2019, our second Model UN Conference. 34 countries were represented, and we were especially delighted to welcome students from our partner school in Radomsko, Poland, giving the weekend a truly international flavour. Hutchie delegates from S4 to S6 represented Brazil, North Korea, Greece, India, Myanmar and Qatar, giving an idea of the strength of our MUN team. Guest speakers Dr Andy Judge gave a stimulating talk on Brexit, while Dr Beth Taylor, former Chair of UK UNESCO Association and a Hutchie FP, outlined the work of UNESCO. Opening the Conference, Depute Rector Jim McDougall reflected on a recent trip to the UN in Geneva, observing that some 8,000 meetings are held there each year. He quoted Médecins sans Frontiers who treat everyone fearlessly without prejudice, but who are not afraid to speak truth to power and he encouraged delegates to do the same. Our Secretary General team worked hard over six months to prepare for the event. They ably got the conference off to a good start, with strong, and impassioned speeches from Osama Bashir and Molly Bambrough, while Lauren Lilley and Cameron Scott brought the weekend to a close. They, along with other senior pupils chaired the committees. Debate was lively and we were delighted that so many first time delegates felt confident in proposing resolutions or making points from the floor. The topics were wide ranging, including trophy hunting of endangered animals, abolition of the death penalty, hostage taking and women’s rights. There was time for socialising too, with a ceilidh on Saturday night, while teachers enjoyed some valuable time to meet and share ideas. All in all, this was a very successful Conference, and we look forward to plans for HutchieMUN 2020.